Moon milk might seem like a new trend sweeping the Internets, but it’s actually an age-old Ayurvedic remedy for sleeplessness. Curl up with this warm, caffeine-free beverage before bed and fall into a peaceful slumber. 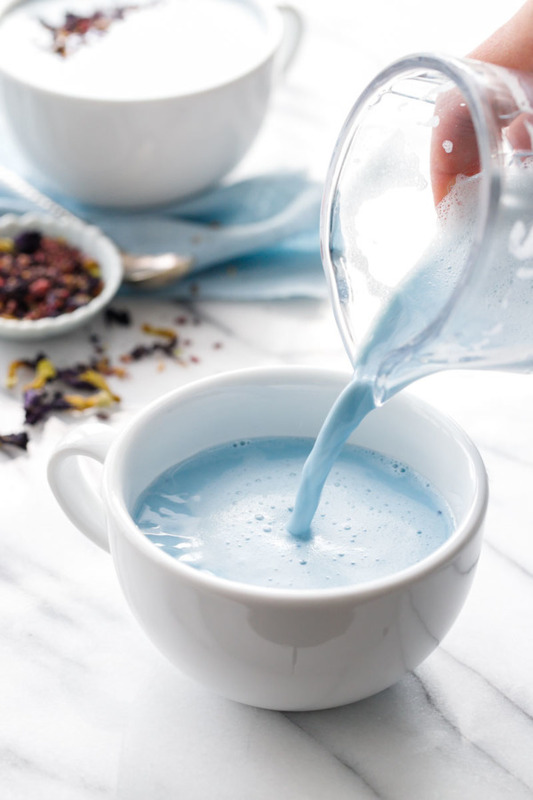 I was originally going to call this a butterfly pea latte or blue matcha latte, but once I read about moon milk… and the fact that this was blue… well, blue moon milk seemed like the perfect name for it. I know, I know, I seriously missed out on an SEO goldmine by not posting this LAST week before the super blue blood moon. 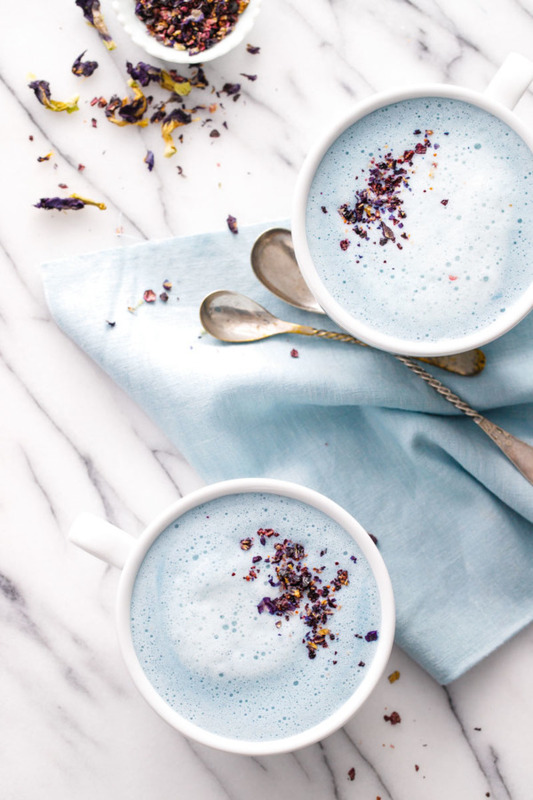 But here I am, a few days late but luckily not a dollar short, with this recipe for a calming bedtime beverage that you can enjoy regularly, and not just once in a blue moon. To add to our already triple dose of calm, many recipes for moon milk call for something called ashwagandha: a plant in the nightshade family (related to the tomato) that is said to promote relaxation and healing. 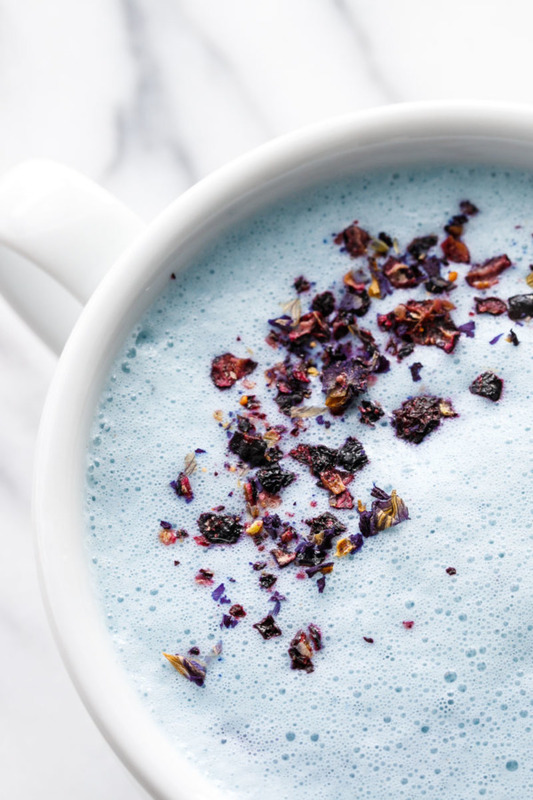 It’s what’s called an an adaptogen: a group of natural substances that are said to modulate your body’s response to stress and balances bodily functions. You can buy it on Amazon in powdered form. Does it really work? I figure it couldn’t hurt to try. I can’t say definitively if it was the ashwagandha or simply the soothing warm milk that is more effective, though I definitely felt more relaxed after drinking a cup, and in that respect it’s probably more akin to a drinkable meditation than a noticeable sedative. What is not up for argument is that this blue moon milk is downright delicious. That alone should be reason for making it; any potential sleep-positive side effects are just the icing on the cake. Drinking a creamy cup of spiced milk before bed is definitely relaxing. The fact that it’s blue? Well, that just adds to the fun. Remember that magic lemonade? The natural color comes from the same source: butterfly pea flowers, this time in powdered form. I used this brand of instant butterfly pea powder, which doesn’t seem to be available at the moment… but there are plenty of similar products out there (just search for “butterfly pea flower powder” and look for a finely ground powder with no other ingredients). Coarser ground flower powders might need to be strained before drinking. 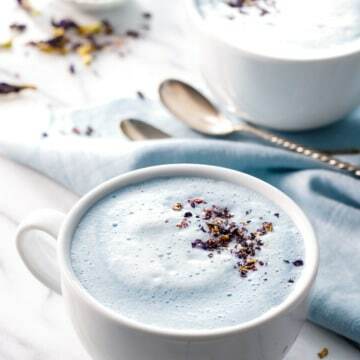 You could also use whole butterfly pea flowers or butterfly pea tea: just steep in the warm milk for 10-15 minutes to impart the color, then strain and reheat with the spices and sweetener. 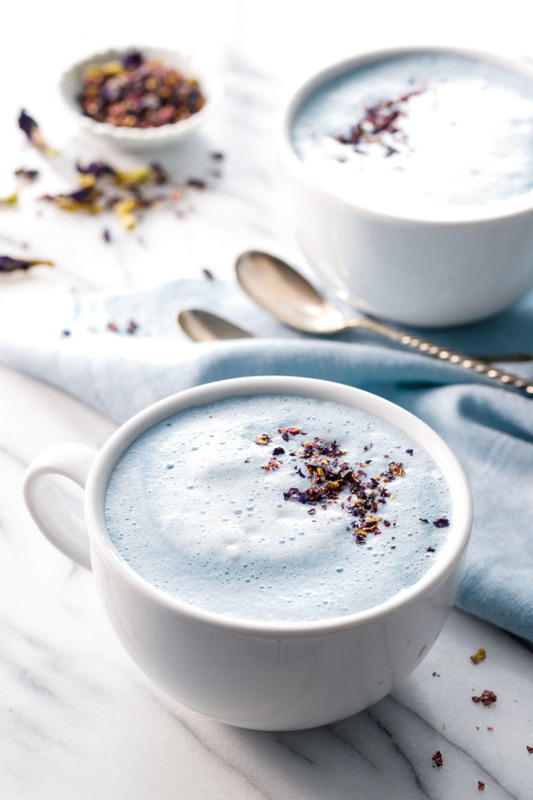 While there is no magic color-changing effect in this recipe (acid + warm milk = ricotta cheese, essentially), you are still getting the full benefits of the natural antioxidants in the butterfly pea flowers, regardless of pH. This recipe is infinitely flexible, so feel free to modify to your personal tastes. Swap the maple syrup for your favorite sweetener-of-choice, add more or less to taste, or leave it out entirely. Prefer cashew milk or almond milk or some other kind of nut/seed/grain milk? Go for it (note that some milks ‘froth’ better than others, otherwise this recipe works with just about any milk you want). Although I wouldn’t add, say, turmeric for example, because it would greatly affect the color of the final product, you can also add other spices to your suit your personal tastes. 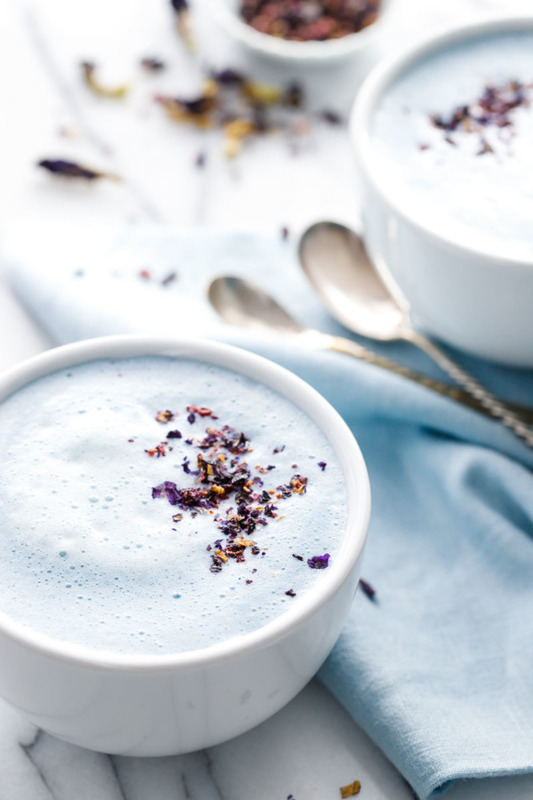 Also, while the butterfly pea powder is what makes the moon milk blue moon milk, you can certainly leave it out and enjoy your regular moon milk just the same. So, yeah… basically everything but the warm milk part is optional. How’s that for a ‘recipe’? I topped my moon milk with a sprinkle of crushed up butterfly pea flowers, lavender flowers, and freeze-dried blueberries… for no particular reason other than it’s pretty and it makes up for my serious lack of latte art skills. 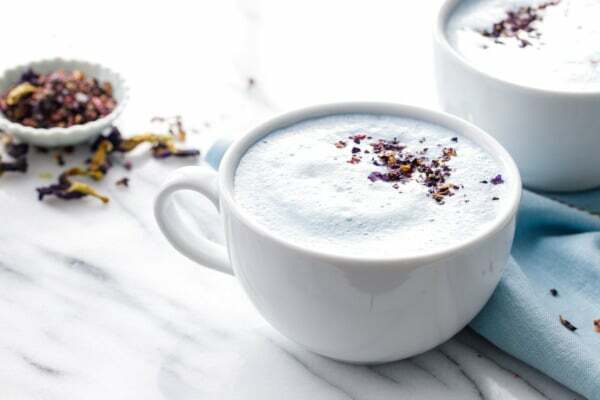 This creamy, lightly spiced moon milk recipe is perfect for sipping just before bed, with ingredients that naturally promote sleep and relaxation.